When choosing the right dog breed for your family, there are a number of critical factors to keep in mind. 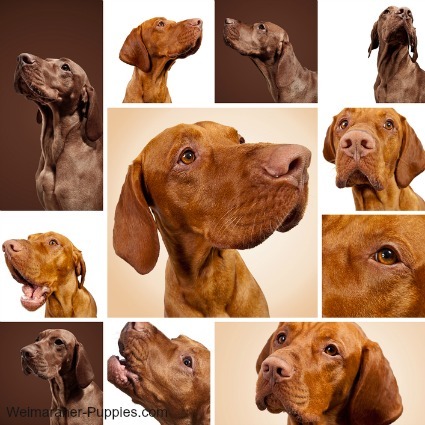 This can be especially challenging, when you don’t have a clue about different dog breeds. And it’s important to remember that, just like people, dogs have very distinct personalities. So, just because you choose a particular dog breed, you can’t predict exactly what your new puppy or dog will be like. Your dog’s personality, no matter what breed you choose, will be unique. However, you can expect some general rules to apply in dog breed selection. And I’ll tell you how Weimaraners fit into the picture, when choosing the right dog breed for you and your family. and will want you to actively participate in his fun! When choosing your new dog, it is important that you learn about the breed, the dog breed’s temperament, and the dog’s special needs. Size – How large does a typical dog get? Some dogs are more suited for apartments and cities, while others do better in a rural environment. Weimaraners are fairly large dogs, reaching 23” to 27” high and weighing in at 55-90 pounds. Grooming and maintenance – This is based on the kind of coat that the dog breed has, and the amount of brushing and bathing the dog needs. 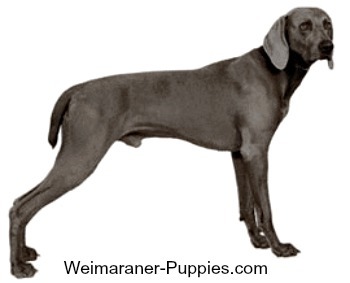 Weimaraners have a short coat. They do shed, but not as much as some breeds. They need to be brushed once a week. How often you bathe them depends on how dirty or muddy they get when they are outdoors. Exercise – Different breeds require different amounts of exercise—a daily walk vs. a daily run. 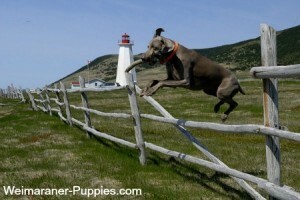 Weimaraners needs lots of exercise, and they need to be walked and run daily for them to achieve optimum health. Health problems – Most dog breeds have some genetic factors that leave them prone to certain health problems. If you select a dog breed that is prone to certain health problems, you will find yourself spending lots of time and money to keep your dog healthy. The Weimaraner is prone to dog bloat, hip dysplasia and a few skin conditions. Personality – Every dog breed has some distinctive personality traits. Some breeds are more aggressive than others, and some are better for families with young children. Weimaraners are very active and headstrong dogs. They like to be in control. In order to have a happy home, you will need to establish that you are the one in control. You will need to be firm and confident, yet gentle with this sensitive breed. Weimaraners can also be temperamental at times, stubborn and utterly demanding, especially for your attention. Establishing who is in charge is the key if you want to manage this wonderful dog breed. Doggie Dan has a fool proof system that will help you establish who is in charge at your house. He’ll tell you what to expect in this video. You can access over 100 of his training videos here now, for Just $1. On the plus side, Weims are intelligent, affectionate and loyal dogs. They make great family pets, as long as they are trained properly. 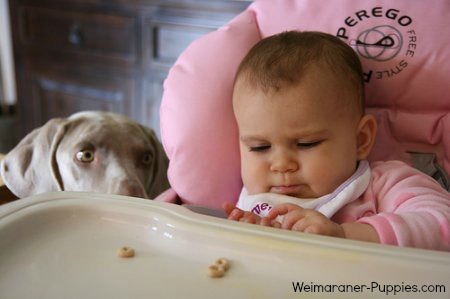 And Weimaraners can make great watchdogs, who will protect your family faithfully. Your home – Weimaraners do not do well in an apartment setting. They are very active dogs and they need to have space to run daily. 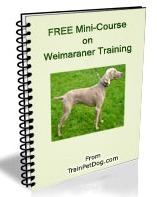 The Weimaraner is an active dog who also requires an active and athletic owner. Weimaraners work well with hunters and outdoor types.